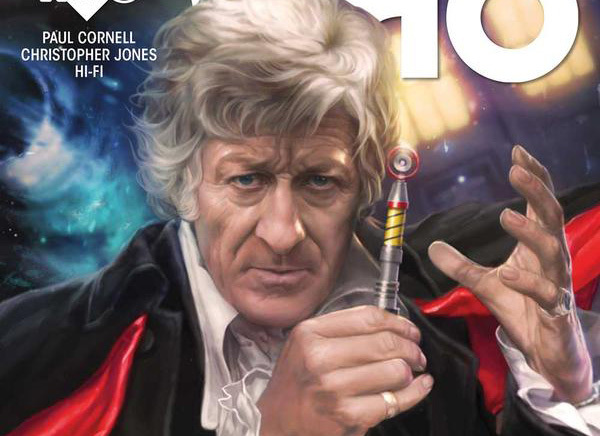 Doctor Who: THE THIRD DOCTOR Miniseries #1 Review @comicstitan | Warped Factor - Words in the Key of Geek. Tony gets his ruffles on. One by one, the Doctor’s lifetimes are being colonised. Not by the alien threat of the week, but by Titan Comics. The Ninth Doctor has become a regular fixture under the command of Cavan Scott, the Eighth Doctor had a triumphant short run thanks to George Mann, the Fourth Doctor has even joined the fray thanks to Gordon Rennie and Emma Beeby. Now Paul Cornell, long-time writer of intelligent adventures for the Doctor, has begun a series of Third Doctor adventures. You see this grin? This grin of fanboy glee? This grin is going nowhere in a hurry. Issue #1 of the Third Doctor adventures stamps itself firmly in the post-Three Doctors territory, where he of the frilly shirts has got control of the Tardis back, but has yet to properly zip off into time and space again – indeed he didn’t really do that until he’d regenerated into the maniac with the teeth and the curls and the infeasible scarf. Nevertheless, that pinning of the story into a very particular chunk of the Doctor’s on-screen lifetime informs the tone here, Cornell giving us a threat that feels fairly modern and zippy while having its roots firmly in everything Pertwee. Jo Grant finally makes her way into the comic-book world, and she’s still having an on-off flirtation with Mike Yates. The Brigadier is as large a presence in this issue as he was on-screen, in control of everything he can be, calling the Doctor when he’s not sure what he’s dealing with. There are moments of air-punching all the way through this issue, placed there like strategic land-mines of joy – The Doctor holding court in what has the feel of a gentleman’s club, a familiar villain revealed, a mechanical, self-resurrecting gang of creatures who look vaguely cybernetic but are something…else, the Doctor’s eyes bulging comically as he’s throttled, Nestene-style, Bessie surprising the living daylights out of a policeman with a sudden turn of speed, Bell, Yates and Benton, the Brigadier calling for an air strike and the subsequent fumefest to which the Third Doctor treats him, the arrival of a UNIT techie with a very familiar name and ailment, and the final panel, which – in true Cornell style – makes you jump up and down and yell, before realising people can probably see you and may not understand. So – the story so far? Mexican waves of ‘We’re not worthy’ as Paul Cornell applies himself to an earlier era than his usual stomping ground. In terms of that tone we mentioned, we never got much of an idea from the on-screen Third Doctor about how the Doctor spent his ‘off hours’ once he didn’t have the Tardis’ dimensional circuit to fiddle with, and the Third Doctor has always been perhaps the most content of all his incarnations to adopt the lifestyle of a privileged gentleman, so there’s something inherently right about seeing him hold court to a gang of other notables, and Cornell gets the tone of his storytelling down pat. Similarly, when he encounters Jo in primitive camo make-up, his response is pure twinkling Pertwee, and these things help to genuinely build the world of the Third Doctor in two dimensions. The Brigadier too is spot on – when the Doctor rages that he hopes he’s happy, having blown the bejesus out of a bunch of aggressive cyborgs, his response is typically Briggish – ‘Thank you, I am.’ Again, it all helps to rebuild in our minds the world of the Third Doctor as we remember it, and more importantly, as it was, while giving it just enough modern spin to excite 21st century fans in its own right. Big ticks then all the way down the list as far as writing’s concerned. But of course, to some extent, you knew this would be the case – Paul Cornell’s a writer who puts the time in to his tone and his characterisation whatever he writes, which is presumably how you get the gig of writing for the Third Doctor in the first place. What about the artwork, then? With the exception of the multi-coloured Sixth Doctor (comic-book series any time soon, Titan folk? ), the Third Doctor’s outfit is probably the most difficult to get consistently right, though as far as a face is concerned, he’s probably something of a gift. 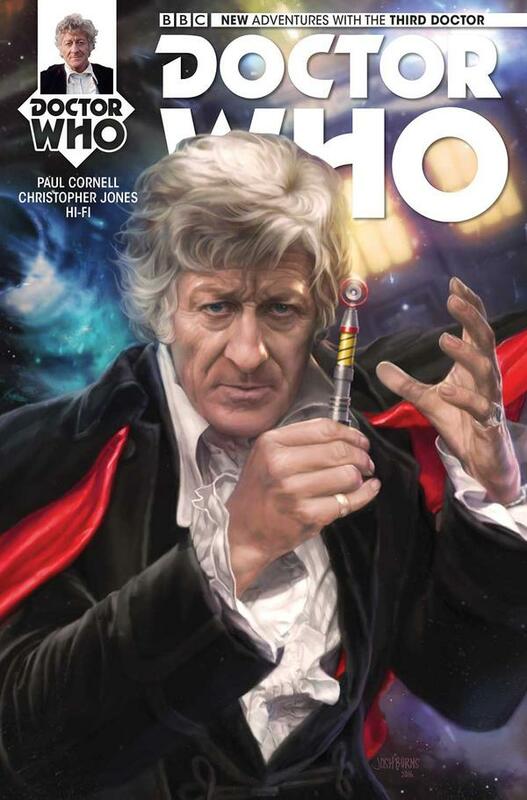 Christopher Jones, on artwork duties here, nails the Third Doctor to the page most of the time. There are perhaps occasional shots that don’t get him quite right, but for the majority of the time, Jones gives us unmistakeable Pertwee, striding about the place like a frilly-shirted crane. The Brigadier too, while perhaps not absolutely photofit-perfect, is more than good enough to pass strutting muster in the face of a new threat and (though he has yet to know it) an old. Jo’s a rather more moveable feast, sometimes conjuring Katy Manning in the flesh, sometimes looking a little more generic and even on occasions looking a little like Liz Shaw died her hair blonde. The visual tone, following Cornell’s lead is the 70s show, but fresh – the zipping from place to place, the al fresco confrontation with a band of marching metal numpties, the scenes of Bessie driving over a barren heath with a huge sky taken almost point for point from The Green Death. In essence, Jones delivers a freshened-up 70s, and HiFi on colourwork turns the richness up to make the 70s look like the high-definition here and now. Pretty much. It’s not as yet some grand treatise on a philosophical point hiding in the pages of an action-comic, it is exactly what it says it is – the Third Doctor comic-book – and it delivers pretty much all you could wish for from such a thing. The Third Doctor, Pertweeing his hearts out. A mysterious bunch of metal gits who don’t take kindly to being blown to bits, a hidden hand of darkness among the higher echelons of British society, and the UNIT boys and girls running and jumping and firing their guns and under no circumstances getting to the awkward bit at the end of a date with Jo Grant. It also delivers those punch-the-air points along the way, and they really are worth it all on their own, returning villains, new villains, and new heroes all spreading a broad smile over your face. Jump on board Bessie with the Third Doctor right now. It’s Paul Cornell, and in Christopher Jones, Titan’s found an artist that can render the period well but give it a freshness to make it feel relevant today. That means only one thing - it’s the 70s (or should that be 80s?) all over again, and it feels wonderful.